We are assuming that you are already done with the installation of the web server and the required database system. Well, you can also use the server offered by the Ruby, which is, WEBrick Web Server. But generally, most of the web applications use other web servers such as Apache and Lighttpd, whenever the application is in production. To set up your database to be used by Rails, you can refer to the corresponding Database System Setup manual. 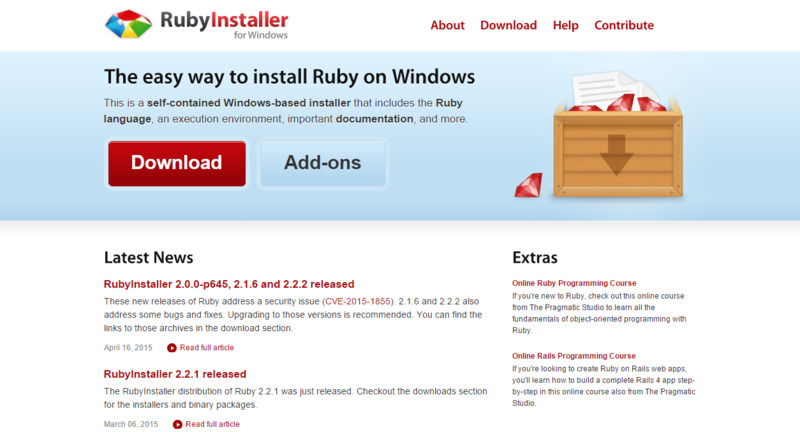 How to Install Ruby on Rails Framework on Windows? For the installation of Rails framework on Windows, follow the given steps. In case, you are displayed with an error only then, you are required to go through the Install Ruby step. Otherwise, you can directly jump to the third step of this whole process. This step is needed to be followed only when Ruby is not installed on your system. You need to start by installing a package from the website: https://rubyinstaller.org/. Under this web page, follow the provided download link. After that, run the resulting installer. This installer will be an .exe (executable) file, i.e., rubyinstaller-2.2.2.x.exe. The installation of this executable file will start in a single click. It is a light weight package which will carry RubyGems along with it. For more details, you can check for the Release Notes. Note – The above command will take time for the installation of all the Rails and its dependencies. It is important that your system keep a continuous connection with the internet during the installation of the gems dependencies. How to Install Ruby on Rails Framework on Linux? For the installation of Ruby on Rails framework on Linux, follow the given steps. 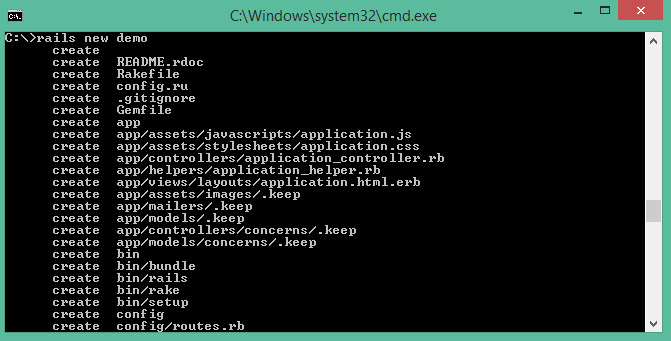 To install Rails on Linux, you will be making use of rbenv tool. Rbenv is actually a light weight Ruby Version Management Tool. This tool is capable of providing the easiest installation procedure which manages all the available versions of Ruby. It also provides a user friendly and concrete environment for the development of web applications on Rails. The following steps will lead you to the installation of Ruby on Rails using rbenv. Now, it’s time to install rbenv tool. With that, you are also required to set the appropriate environment variables. The following set of commands will help you to get the rbenv tool for the git repository. * other RDBMS (Relational Database Management System). How to Keep Ruby on Rails Updated? 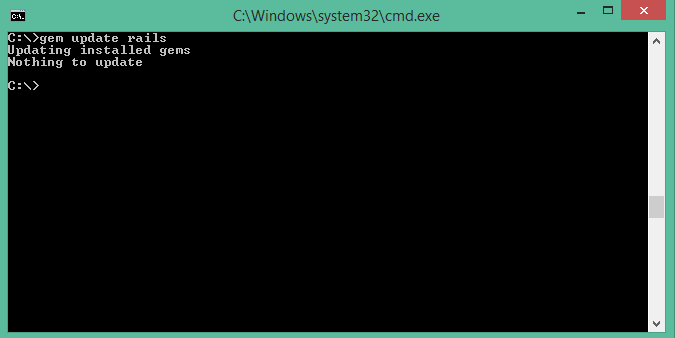 Though the following screenshot is of Window’s command prompt. But this output will be the same for Linux’s terminal. The command will help you to automatically update your Ruby on Rails installation. And this upgradation to work properly, you need to restart your system after the successful completion of the Rails upgradation. Note – Keep in mind that you need to be connected to the internet during the processing of this command. The above code will generate a demo Rails project that we will be discussing later in the module. Well, the above command will also be used to check whether the Rails environment is set up properly or not. After this, you are required to type in the following 2 commands to run WEBrick web server on your system. The above command will generate an auto-code which will lead to the starting of the web server. The next thing you have to do is open your web browser and type in the given URL: http://localhost:3000. The display screen will prompt a message “Welcome abroad”. You can also get another message such as “Congratulations” indicating the successful installation and set up of the Rails on your system.